If you are the familiar with the popular dishes that 9 out of 10 Indian restaurants never fail to offer, Dal Makhani has to be one of them. This luxurious dish tops the favorite’s list among Indians and non Indians, esp. the vegetarian group. Every spoonful in the mouth is a sensational and slow burst of flavor and texture. Yes I am pretty passionate about the Dal Makhani! We eat it with naan, or rice or just by itself – well like a soup! The outside is at last breathing spring! The little cardinal is back knocking on our window. Here is a snippet that we had recorded last year and it is happening at the exact same time! How amazing it is that the nature just knows, no clock, no predictions, no weather reports – the little birds who had been so silent for the past few months are chirping again. I love the quiet of the dark and the tiny tweets in the morning. The sky gradually lifts the dark veil and breaks out into vibrant red and pink hues and the warm sunlight has been gently touching our windows. My heart is already singing. Keeping my fingers crossed that the temperatures will not go back to freezing again. With the frost of the air almost gone, we are getting active; being more outdoors, yard work, preparing for spring and summer plantings and entertaining. I had been planning to post the recipe for Dal Makhani for many months now, but every time I make I have not been taking any pictures; the day light is short and I do not have special lights for foodography. I did it this time. I have given the link to how to make the Makhani Masala/ Butter based Tomato Cream Sauce I had posted before. This sauce is a must for this dish; you can make the sauce when you are cooking this or use the frozen one as I have done. Notes: For the authentic flavor, DO NOT give the fenugreek seeds and the kasuri methi (dried fenugreek leaves) a miss when you are preparing the Makhani Masala. The primary flavor of the dish comes from these spices/herbs. Soak the lentils/beans (black urad, kidney beans and chana dal) over night. Wash them well and drain. In a deep, thick bottomed pot/dutch oven heat the butter/oil/ghee. Add the cardamom, cumin seeds and the slit hot green chili peppers. When the seeds sizzle, add the onions and cook at medium heat till they are clear and soft. Add all of the drained lentils/beans, and salt; toss them together with the oil/ghee/butter and the spices and cook for about 5 minutes at medium to high heat. Stir in the Makhani Masala/Butter Based Tomato Cream Sauce, toss everything together to be well combined; all the lentils/beans should be well coated with this sauce and simmer at medium heat for about 10 minutes while stirring once in a while. Add the warm water to the pot, stir and cover; simmer at low heat till the beans are tender. This might take a couple of hours. For a quicker version use the pressure cooker to cook as I always do. After the lentils/beans are tender, mash some of them with the back of a big spoon. Stir everything together in the pot. It should be thicker than a regular soup, but not dry and clumpy. The consistency should be such that it easily coats a big spoon and yet can be poured out. If there is too much water left, keep on simmering till this consistency is reached. If it gets too dry, add some more warm water and keep simmering. Cook for about 10 minutes after you have reached the right consistency. Stir in the milk/cream in the pot and lower the heat, cover and cook for another 15 minutes. Serve hot with Naan or Roti (or any Indian flat bread). Top with more butter/ghee/cream if you want. I served the dal with Tawa Naan and Raita… one delicious heartwarming meal. Note: Dal Makhani freezes pretty well. If you decide to freeze the extra, make sure that you DO NOT add the cream or milk. Freeze it right before you add the cream. When you need to use the frozen dal again, defrost and put it in a pan on stove top, simmer for a while and then add the cream/milk. Serve immediately. Being sent to MLLA-19th Helping held at EC- Simple Indian Food, brainchild of Susan of The Well Seasoned Cook. Lentils are a staple in Greek cuisine too and that’s why I feel right at home with this dish! Oh my that looks so rich and creamy Soma..i love the color!! always loved this dish.thats exactly the restaurant look, very rich and creamy. what a color…yummy..this sure is a flavorful, rich and creamy dish !! Asha you are absolutely right! A swirl of cream would have made it picture perfect 🙂 I did add a dollop of butter before I took the pictures.. but all of it melted by time I was done clicking. Perfect! That is an awesome combo! I love lentils! That looks so rich and comforting. Love all those spices. Beautiful and delicous. Now just need roties to dipp in. I love this curry and this looks awesome, Soma! Sounds lovely, and what a great colour! My veggie daughter would love it. I love dahl although I have never eaten it outside India or outside of an Indian restaurant. This looks like a great version and that color is just amazing! Lentils in creamy tomato sauce sound fantastic, I love the color of this dish! Very creamy and rich–looks so perfect. What a luxury a bowl of this would be along with some delicious garlic naan for dipping. Nice to find another dish using lentils. in the Caribbean we eat a lot of lentils, just never come across this dish before. Love the vibrant colour. I love dhal makhani but never seen such a color! Looks excellent! Maninas, I am waiting to see to make this! yours are always so stunning! 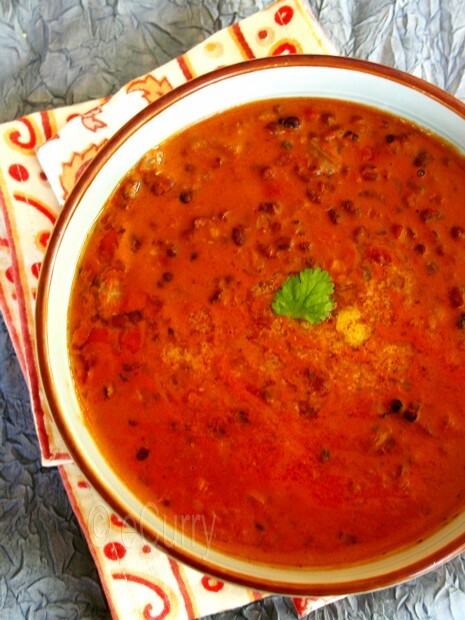 I love dal makhani…yours look really delicious and perfect!!! Tooo tempting. Looks very delicious. I have never added channa dal in Dal Makhani. In our place here sunlight is a rare commodity and I find it hard to take pics and yes, It is a Jade Budha in my Kesari Pic. One of my favorites, and the picture tells me yours must have tasted brilliant ! Sigh. Your dal looks like a dream and is one of my very favorite restaurant orders. Definitely making this one! THANK YOU. This dish looks fabulous!!! I was planning on going to the local Indian market to actually buy kasuri methi for another dish and then found your blog on foodgawker. This is definitely a sign to not put off my shopping trip any longer. Wow, what a great-looking dish. I’ll be making this soon. This dish looks amazing! I love lentil soup. Delicious! 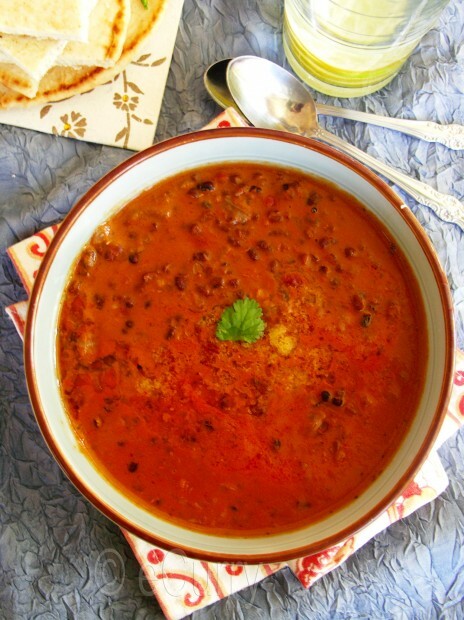 looks yummy…..U r right one of the top list dish in Indian restaurants is Dal Makhani….but I never eat it in the restaurants…love to make it at home….though time consuming(simmering part) but u don’t have to baby sit it…always make double batch, as it tastes much better the next day. Gorgeous colors, creamy, and totally delectable..all what I want in a dish!! I know Supriya:-( Back to 30’s..and big coats. I am not looking forward to it. Wow…that’s an creamy medley of dals…look extremely appetizing….. This looks and sounds mouthwatering! I noticed this calls for 3 cups of the sauce… Is that how much one recipe yields? I can’t wait to try this! I have updated the Makhani Masala post with the amount. Thanks for pointing that out. That is approximately how much it yeilds. But you may do more & freeze. The amount I have given for the Dal makhani actually makes quite a lot!!! The Dal will soak and more than double the amount, so with the cream & sauce and water.. it amounts to quite a lot. So if you only cooking for a few you might want to reduce all the proportions. I will update the amount here too. I was silent for atleast 6 months since I fell in love with this blog and reading it regularly. I adore u’re color senses and they way u cook up things. This creamy masal caught my eyes and I made the sauce and added some cooked whol green moong dal along with some sauteed chopped onions and cumin seeds. It turned to be wonderful as there were oohs and aahs in my nephew’s b’day celebration for which I served them with hot pooris. Thanks a lot Soma for a keeper recipe! I am really glad that you enjoyed. It is a versatile sauce & I like the way you used it with the green moong! 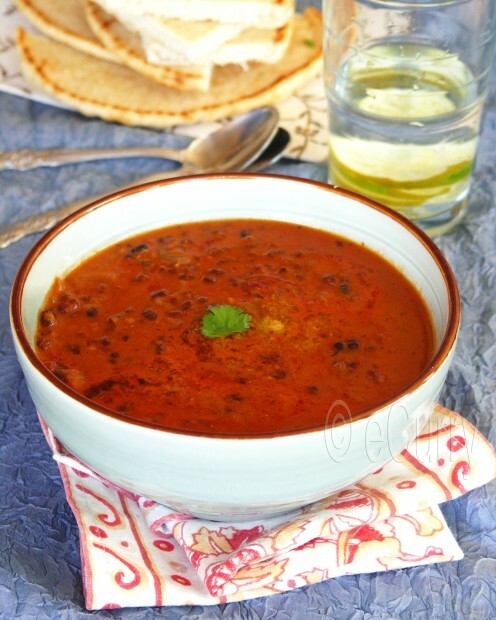 Delicious Dal Makhani Bukhara, looks truly yum and mouth watering. This dish was very good. I allowed my dish to be a bit thicker than yours, and it was very good. I took pics of the dish, so whenever I blog about it, I’ll let you know. Thank you for another good recipe. I blogged about this dish. Thanks again! I made this Makhani Masala today. Loved the Dal Makhani. hi. i had a question. your recipe looks really good. but where i stay i dont have the means to get black urad dal so what can i use to substitute for that? i know it wont be the same dal makhani but i really want to make it and as i dont have urad dal what can be used? 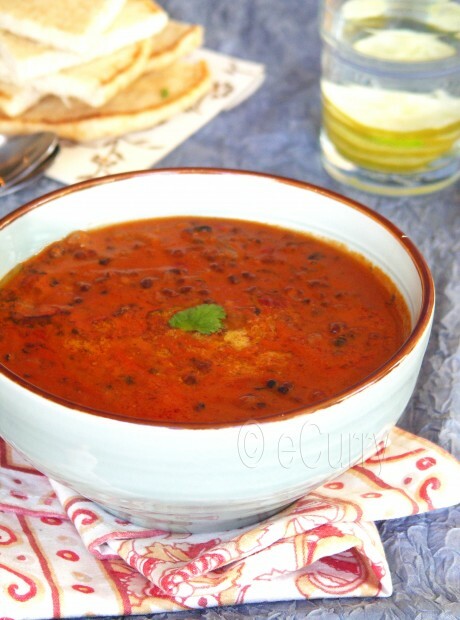 Try using whole masoor dal (brown lentils) if you cannot get hold of the black urad dal. it won’t be the same, but it should work. Thank you for giving it a try and really glad that you enjoyed! I made this yesterday, a cold rainy day when I had to be at home. I looooooove dal makhani and this is the only recipe I’ve found which actually cooks the dal in the makhani sauce. I am so impressed with the results even for an amateur like myself. It took a long time but was not difficult. I used milk rather than cream because my partner doesn’t like heavy creamy food. It was so delicious my partner demanded a detailed explanation of the cooking process. He couldn’t believe it was made from scratch. I made a double batch of the sauce and froze it so we are good to go for a second round later. Thank you so much for posting this recipe. So glad to hear that you liked it! yes the milk works too and when i make it at home for the everyday kind, I skip the cream and use milk. I know what you are saying about the other recipes cooking the dal separately. For the longest time now, I have been cooking most of my dals along with the spices.. first it is easier as I am not doing the cooking twice and secondly, I feel the flavor of the spices infuse way better with the lentils when it is cooked together and longer..esp. in a dish like this where the flavor is the most important thing! My husband had been wanting to eat home cooked Maa ki dal for the longest time( we’ve been married for 6 years). I was never happy with the recipes I got from friends. I gave up the idea of making it at home until I stumbled upon ur blog and found the receipe simple as well as the dish looked mouthwatering. I knew I had to try it our. So I made it last weekend and also had friends over for dinner and all I received was praise for the delicious Dal Makhni!!!! So thank you Soma and now I’m a regular with your blog! One of the biggest compliments I could ever have. Thank you so much. You made my day!! Do you pressure cook the dal right after soaking or at the end with all the ingredients? Looks great! I pressure cook the dal at the end with all the ingredients. The dal may be pressure cooked first and then combined with the sauce too, but I find this easier/less work and the flavors set in much better if the dal is cooked together with the other ingredients. I have recently started cooking more and more Indian food and this looks super amazing! I never liked any of the currys my mum used to cook when I was growing up because she used some generic crappy curry powder sold in supermarkets here in Australia. I have a couple questions with this. The urad dal, does it need to be whole or spilt? Also how long do you cook it in the pressure cooker for? Whole Urad Dal with husks. The cooking time will depend on your pressure cooker. I have the one that just hisses and I takes about 15 mins. max 20 minutes and then I allow it to cool down before I open it. See instructions for cooking beans if possible and match it to the amount. This Urad will cook faster than red kidney beans or garbanzo beans. I hope I could help. 1) You mentioned not to add cream if freezing the daal. Why is that? What happens if I add cream and freeze it? 2) Beginning of the post you mentioned lentils are simmered for hours, however in the recipe it seems for a lesser time. I Remember being told, longer you simmer, the better the results are. Right? So if I simmer it for hours and freeze it (with or without cream), would I still be able to get the same taste? If you freeze with dairy/cream added to it, the dairy might split when the frozen dal is reheated. The same reason why in the recipe of Makhana Masala (which freezes very well too), I have mentioned not to add the dairy. You can add the cream or even milk for a lighter version when you are re heating. The dal is indeed simmered for hours traditionally and it does taste better. I have used the pressure cooker here. Yes you can simmmer it the traditional way and simmer it longer. Hope it works out for you! I have tried this dish long back and it turned out awesome. 1. half the qty of makhani sauce ? we can grind it along with spices) but wont the 2- black cardamon change the taste of the gravy? sorry to doubt here..
to get that unique flavour .. Regarding your blog you write very good.more than the dish i feel like reading your write- up. Great work and really appreciate your efforts. I just feel like sometimes wish you would have some more pics of the cooking procedure, as it helps remembering it fast to follow..i know its too much to ask.. Thank you so much for your support and trying out recipes!! I am not sure I understand your first question right. Do you want to half the makhani sauce for this give amount of dal? If so, you may. it is just that it will be more dal and less of the makhani… more like the everyday Maa ka dal.But if you are asking if you are to half the amount of the entire dish then yes you half everything in proportion. Yes the Makhani sauce can be blended for smoother texture too. You can blend and freeze it too (without the cream), that way you have it ready and just add to the dal and cook. If blended well the black cardamoms disappear. I have a Blendec which is very powerful and I do not see any remains of spices. However if it bothers you, you may just remove it by picking it out once it is done. For garam masala if I am buying store bought, I have used Everest and Rajah. Like the Everest better. I have not tried many brands so cannot tell. Esp. for Garam Masala and for a dish like this, I would recommend (and it is my personal preference), not to use typical brands from the South. Nothing against them, but the flavors are slightly different I feel. Could be my bias too. You have to decide which one to prepare 😉 If the makhani sauce is ready at hand I think all makhani dishes become really easy to make! I understand you wanting to see the step by step. I hardly ever cook for the blog – meaning cook to make a blogpost. I blog about what I cook. So it becomes a little difficult and time consuming… however if there is a difficult step, I do try to use an image for it. I 1ST tasted DalMakni While away fm India,n fell in luv wth dish wtht knwng its name.So i asked n asked questions abt it bt black uditedal?does it realy taste so well? Its bn yrs since then,Nw in INDIA wks aftr buying Black Dal,searching net n coockbuks for wks,2dy I prepared Dal Makhni with ur makhni masala.And Believe me,Though I was scared dat dish mayb failure bcs I am nt regular cook bt am disciplined follower,Dal Makhni matched taste to visuals with I had abroad.This s nly 2nd time in my life I tasted DalMakhni. I followed all ur instructions to T,abt both masala n makhni.excpt I added dried red chilli,n little sugar to taste.I used prestige pressure pan to cook for 3whistles n again aft opening n adding water did 3more.Then aft adding warm water,cream,milk,some more kasurimethi let it simmer for 15min on low heat. We r marathi,n we know our lentils vry well.Moong,Masur,Waal,Kale chane,chawali,Green Black Yellow Peas bt Daal Makhni,restaurant style at home,dat 2 at 1st attempt n instant hit. Wow,u made my day n dish on our supersunday lunch.When I found ur Makhni masala blog i knw dis wht I wanted. P.s.2dys dish o/d s dalmakhni,I made JiraRICE wth Sanjeevkapoor recipe(wth1strand of jaipatri )n Naan wtht yeast by A.Dassan of vegrecipesof ind.Both r 1st timers n hits too. Best dal makhani recipe I’ve tried by a significant margin. Absolutely delicious. Mine ended up a more standard brown color rather than the bright orange pictured here, but that probably comes down to the tomatoes and the total cooking time. You’re absolutely correct when you say the fenugreek is essential; I had always wondered what had been missing from my previous attempts at this dish. It also works just fine to cook the dal in the curry sauce – I do not think I will bother ever cooking it separately again.